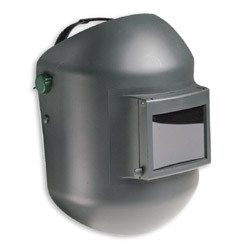 Description: Lightweight welding helmet with Flip-up lens.Unique straight shell, impact resistant and durable.Ratchet adjustment type suspension. Materials: Shell – PA6.Polyamide with flame retarding and reinforced additives.Excellent dimensional stability under heat.No dripping off or residual burning of shell in contact with heat.Radiation heat resistance up to 180°C. Cover lens – Mineral glass. Welding lens – Mineral glass shade 10. Lenses dimensions: 50x108mm / 55×110 / 60×110. 75x98mm / 85×110 / 90×110. Application : For all the welding applications except welding applications above the head. Packaging: 8 pieces per carton. 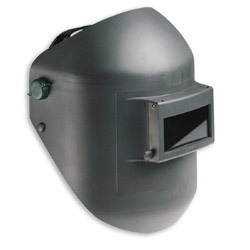 Description: Lightweight welding helmet with 50x108mm Flip-up lens.Unique straight shell, impact resistant and durable.Ratchet adjustment type suspension. Materials: Shell – PA6.Polyamide with flame retarding and reinforced additives.Excellent dimensional stability under heat.No dripping off or residual burning of shell in contact with heat.Radiation heat resistance up to 180°C. Cover lens – Mineral glass.